In 2014, Federico Sevilla was diagnosed with prostate cancer, confirming his and his family’s worst fear. Before the unfortunate news, Federico had undergone a biopsy, as suggested by his doctor Dennis P. Serrano of St. Luke’s–Global City. Fortunately, it was still in the early stages when discovered. “If diagnosed early, prostate cancer can be cured. Localized prostate cancer, or one that has not gone beyond the gland itself, can be cured by surgery,” says Dr. Serrano. 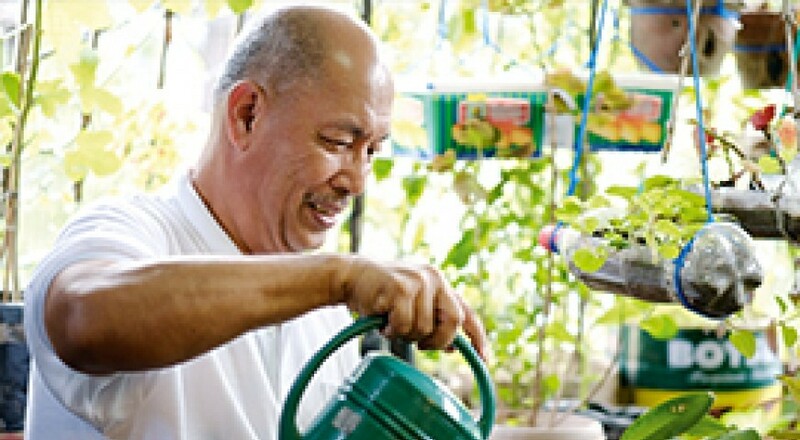 Prostate cancer is the fourth most common type of cancer, and the fourth most fatal malignancy among Filipino males. According to statistics, around 14% of men will be diagnosed with prostate cancer at some point in their lives, with those aged 55 and older as the most susceptible. At 66, though, Federico might be too old to go under the knife, but he was no stranger to challenging situations. His resume includes four years of service as a firefighter in Manila and a decades-long career as an overseas Filipino worker (OFW) in the Middle East. His first stint as an OFW in Jubail, Saudi Arabia, where he was a safety engineer for a construction project, was no less than traumatic. For five consecutive months, he didn’t get a single paycheck. “The company was in shambles,” he says. But tough as a firefighter that he used to be, Federico weathered the blaze, moved on, and ascended the ranks to quality control engineer. He worked at McDermott International’s Dubai facility for more than 20 years. Federico’s eldest daughter, Norina, has somewhat followed in his footsteps. She works as a head nurse in Hamad Medical Corporation in Qatar following a 12-year stint in both St. Luke’s–Quezon City and Global City. Similarly, his youngest daughter Nenita, who worked as a medical technologist in St. Luke’s–Global City for 4 years, has gone abroad, and is now a medical technologist in Singapore. Meanwhile, daughter Nadia is the department manager for purchasing in St. Luke’s–Global City. “At first, it was hard to accept [his condition] since it was a serious disease. We were worried that he might not get back to normal anymore,” Nadia says. Treating prostate cancer can now be done through robotics, using the third-generation da Vinci Si robotic surgical system. The world’s most advanced technology in surgery, the system boosts surgical precision while minimizing invasiveness. Such advantages were proven by Dr. Serrano when he performed the operation with only small incisions on Federico’s abdomen, minimizing blood loss. The robot’s arms were docked on Federico’s abdomen and controlled by Dr. Serrano through a computer console a few feet away. The arms have mechanical wrists that can bend and rotate like human hands. “It has a three-dimensional camera with 10 times magnification. With better vision, we can control bleeders accurately and there’s almost no blood while we are operating. We can suture, tie, and cut with precision. We can also better preserve the important nerves around the prostate,” Dr. Serrano explains. Initially, Federico preferred the traditional procedure, which is cheaper but the duration of the operation and the period of recovery are longer than robotics’. In the end, he felt relieved for having chosen otherwise. “I’m not feeling anything that I was feeling before I had the [prostatectomy]. I’ve felt no pain [since the operation],” he remarks. Now 68, Federico routinely drives his grandson Deric to school. He began doing it in only a week after the operation two years ago. “I’ve had experiences in other hospitals, but the standard [in St. Luke’s] is really high. Even before the operation, I was confident with Dr. Serrano. I really felt positive that I would be back to normal,” he concludes.